Eric Robertson, an Alumnus of the Stratford Chefs School (Class of 2011), is an Ontario native and has cooked in some of Europe’s best kitchens before finding his way home. 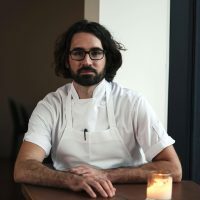 Robertson spent most of his time abroad cooking in Belgium, first at the now-shuttered Michelin-starred tasting menu destination In deWulf in rural Dranouter, and then running the kitchen at its more casual offshoot, De Vitrine in Gent. Eric met Daniel Hadida when he was working at In de Wulf and kept in contact, both being expat chefs over in Europe. In de Wulf eventually opened a second restaurant, which Eric was running for about a year and Dan came over and hung out for a couple days in the kitchen. When Eric came back to Canada, he visited Daniel and knew they were looking to set up something similar, something a little rural – a destination restaurant. Both chefs take pride in serving fresh, high quality ingredients from small-scale organic farms, and ultimately, Daniel graciously said, “Hey, you wanna come do this together?”. The two chefs opened The Restaurant at Pearl Morissette in November 2017 in Jordan Station, Ontario. Following rave reviews for an ever-changing multi-course menu inspired by seasonal French cooking, The Restaurant at Pearl Morissette was selected as the #1 new restaurant in Canada for 2018 by Air Canada’s enRoute Magazine.